Three-dimensional models can serve a multitude of purposes, from applied medicine to teaching. It is no problem to produce models in parts or at a much larger or smaller scale than the original structure. 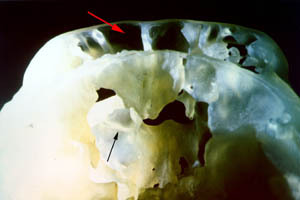 Models are used by doctors to plan and perform plastic surgery; they allow students to "get in touch" with their fossil ancestors; they can help anthropologists to better comprehend the spatial relationships of structures as it was mentioned above in the case of the Tyrolean Iceman or in the case of heavy pneumatization of some Homo heidelbergensis crania. Though studies had been undertaken with radiographs and even with two-dimensional CT-data, the true extent and relation of pneumatized cavities including paranasal sinuses and cranial base could first be realized when stereolithographic models were available.